As Cleveland NORML and other hemp advocacy groups are active in Northeast Ohio, and Ohio-wide, I certainly expect there will be some informative and useful Hemp History Week activities in the real NEO area, to help prepare Northeast Ohio for the brightest, greenest new economy revolution we shall ever have to come - the development of the industrial hemp economy in this region - which shall begin for real when our leaders take the appropriate, innovative steps to legalize and develop the hemp economy here. If Ohio's and America's leaders haven't figured out their next steps with legalizing hemp by the beginning of May, Hemp History Week will be an excellent time to drive our points home. Industrial hemp has played a significant role in American history. In fact, in the early 1700's American farmers in Virginia were required by law to grow it. Today, healthy and sustainable hemp products are sold across the country, but American farmers are prohibited from growing this crop. Did you know that ice-cream, non-dairy beverages and protein powders can be made from nutritious hemp seeds? Or that body-care products like soaps, lotions, and lip balms contain hemp oil? And that hemp fibers can be made into environmental friendly paper, fabric and building materials? Hemp History Week seeks to celebrate America's rich history with industrial hemp and generate strong support for the re-legalization of hemp farming. 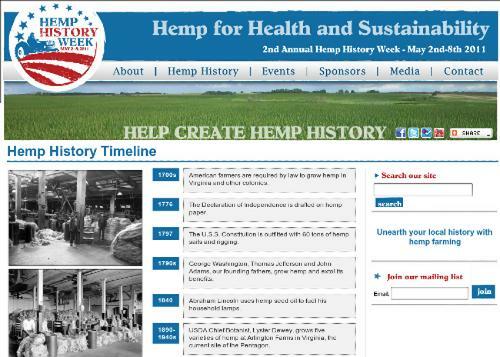 Get involved with Hemp History Week today! Hemp History Week is a national grassroots education campaign, which is designed to renew strong support for hemp farming and processing in the U.S.
Did you know that America's history is rooted in growing hemp? Thomas Jefferson once said, "Hemp is of greatest importance to our nation," and yet today the U.S. is the only industrialized nation where growing hemp domestically is prohibited. That is why we are advocating that the U.S. federal government change its policy towards industrial hemp, which confuses oilseed and fiber varieties of Cannabis grown for food and industry with drug varieties of the plant. Celebrate America's rich history surrounding hemp farming, processing and marketing before it was banned and to educate the public about the barriers to hemp farming in the United States. Engage consumers by highlighting the range of hemp products available and the nutritional as well as environmental benefits that they provide. Advocate for a federal policy change while sending a strong, positive message to President Barack Obama and Attorney General Eric Holder to end the ban on hemp farming and let farmers once again grow the versatile and profitable crop. Hemp History Week will feature a national retailer program with over 500 participating stores, local events, hemp product sampling and virtual postcard signing. Supported by leading hemp manufacturers, natural foods retailers, celebrities, farmers, historians and hemp advocates, Hemp History Week is all about celebrating the goodness of hemp. It's been over 50 years since the last commercial hemp crop was planted in the U.S. Help us 'Create Hemp History' once again. Please get involved today. The U.S.S. Constitution is outfitted with 60 tons of hemp sails and rigging. George Washington, Thomas Jefferson and John Adams, our founding fathers, grow hemp and extol its benefits. USDA Chief Botanist, Lyster Dewey, grows five varieties of hemp at Arlington Farms in Virginia, the current site of the Pentagon. USDA Bulletin No. 404 shows that hemp produces four times more paper per acre than do trees. Popular Mechanics article "New Billion Dollar Crop" explains that new developments in processing technology could use hemp to manufacture over 25,000 different products, "from cellophane to dynamite." Henry Ford builds an experimental car body made with hemp fiber, which is ten times stronger than steel. American farmers from Kentucky to Maine to Wisconsin harvest over 150,000 acres of hemp through the USDA's Hemp for Victory program. Hemp is last grown in the U.S. due to government confusion over hemp and drug varieties of the plant, while new government incentives for industry replace natural fibers with plastics, ultimately bankrupting key hemp processors. The U.S. begins to import food-grade hemp seed and oil. New processing technologies arise to commercialize "cottonized" hemp, hemp concrete, high-tech hemp composites and other novel hemp applications. Ninth Circuit Court decision in Hemp Industries Association vs. DEA permanently protects sales of hemp foods and body care products in the U.S.
A bill is introduced in the U.S. Congress for the first time to allow states to regulate hemp farming, but to date no committee hearing or floor vote has taken place. The first hemp licenses in over 50 years are granted to two North Dakota farmers. HIA uncovers diaries and photographs of the USDA's Chief Botantist Lyster Dewey, who grew 5 varieties of hemp on the current site of the Pentagon. Rep. Ron Paul makes Congressional statement in support of Hemp History Week. 1st Annual Hemp History Week produces 200 events in 32 states exposing 100,000 people to hemp and the cause.